Books • Utah writer breaks out big 1,001 pages big  in The Way of Kings. Author Brandon Sanderson Jim Urquhart | The Salt Lake Tribune&#xA;Provo residents and sisters Pamela Dorsey, left, and Kathleen Dorsey holds stacks of books as sci-fi author and BYU professor Brandon Sanderson reads from his book "The Gathering Storm" Monday, November 2 2009 at Sam Weller's Zion Bookstore in Salt Lake City. Brandon Sanderson started reading Robert Jordan's international best-selling "Wheel of Time" series as a 15-year-old boy. Now a professor at Brigham Young University, he was chosen by Jordan's widow to complete the series using notes Jordan left behind. 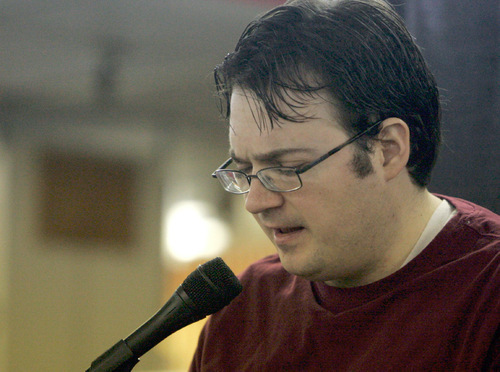 11/2/09 Jim Urquhart | The Salt Lake Tribune&#xA;Sci-fi author and BYU professor Brandon Sanderson reads from his book "The Gathering Storm" in 2009. When Brandon Sanderson found himself atop The New York Times' best-seller list late last year for his book inspired by Robert Jordan's The Gathering Storm, he was sanguine but reserved about his own works. In a backstory that has its own fantastical elements, Jordan's widow selected the Provo writer to finish the Wheel of Time series. "Even though this is more important," Sanderson said last November, "it doesn't make it any less easy to put aside all the books I was planning to write." 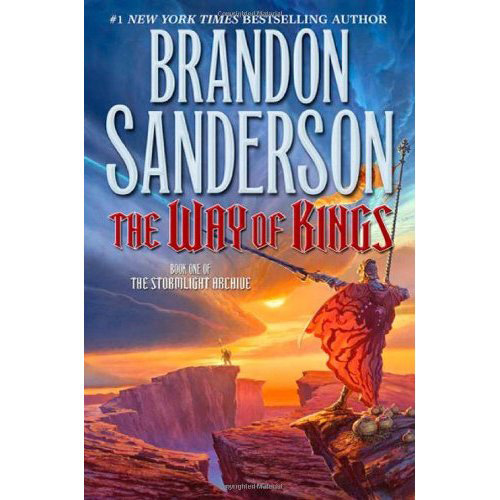 The task of staying away from his own fictional themes proved so difficult, in fact, that Sanderson spent months putting the finishing touches on a 1,001-page opus titled The Way of Kings. The book's official release on Tuesday, Aug. 31, is being celebrated with two local events. "I like big books, because if I fall in love with a big book there's a lot to love," said the 35-year-old writer from his home in Provo. For lovers of epic fantasy nationwide and across the world, Sanderson is a writer from whom big things are expected. Not bad for someone who started small, fleshing out characters and plots during night shifts at a Provo hotel and weathering rejection letters from 12 top creative-writing MFA programs. A Nebraska native and Brigham Young University graduate, Sanderson has twice been nominated for the prestigious John W. Campbell Award for science-fiction and fantasy writing. 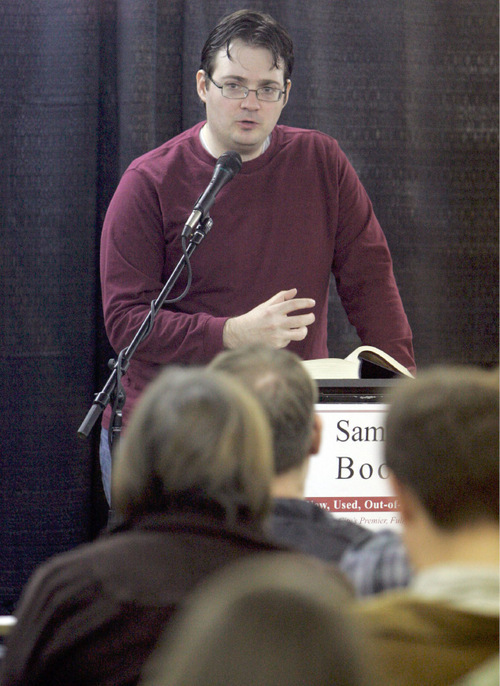 Before becoming heir to the legacy of Jordan, whose books have sold 44 million copies, Sanderson staked his own fantasy turf with his Mistborn series of books. With the June 2009 publication of Warbreaker, he became known as a long-distance runner of fantasy fiction, creating cultures on distant worlds rife with conflict-torn characters and inventive props. No less than the satiric publication The Onion gushed over Sanderson's ability to conjure a "world that's easily complex and mysterious enough to warrant sequels, [but which ends] climactically, answering many of his biggest questions, while leaving others to the imagination." For The Way of Kings, Sanderson offers up Roshar, a world so tempest-blasted that animals live in shells and plant life has evolved to reel in grass and branches with the onslaught of regular wind storms. The most prized possessions among inhabitants are the all-powerful "shardblade" swords and "shardplate" armor left by an ancient order of Knights Radiant. The first installment of Sanderson's planned Stormlight Saga drew almost 1,000 fan requests for one available advance copy on the website of his publisher Tor. Mi'chelle Trammel, who along with her fiancé launched a celebratory website  http://www.17thshard.com  read the 1,001-page tome in just under two weeks. "It's long, but the way it's structured doesn't overwhelm you," she said. Sanderson said the greatest magic trick of all great epic fantasy stories, from J.R.R. Tolkien on, is the monumental task of placing believable characters inside an unbelievable world. His book's three main characters  Kaladin, Shallan and Dalinar Kholin  come with built-in contradictions. Sanderson said he understands the warring sides of human nature from personal experience, labeling himself a faithful member of the LDS Church who also likes to question. "In all good fiction, epic fantasy included, the big control group is human experience," Sanderson said. "The moment when fantasy becomes identifiable is the moment you also find characters people can really fall in love with." The Way of Kings has been his labor of love ever since he started writing, the culmination of nearly 15 years of work. Sanderson wrote an initial draft years ago, offering it to Tor in New York City after the book company agreed to publish his Mistborn series. Interest in the mammoth book was high, but editors advised Sanderson to let it steep. Writers rarely make their initial reputation based on such gargantuan efforts, Sanderson learned. Instead, they start with smaller titles more easily digested by the public. It was only after Sanderson struck it big with his first installment of Jordan's Wheel of Time series that Tor told him to pick up the pace. Publishers don't want to sit on the work of a New York Times best-seller. So Sanderson tackled the book anew, all while promoting the Jordan saga and finishing up its sequel, Towers of Midnight. But he didn't embark on it all without consulting his better half. "We talked about how this would essentially be like my residency if I were in medical school, and we realized that having so many of my books on the market at once was an opportunity that was hard to pass up," Sanderson said. One year of 16-hour-straight workdays, with only Sundays off, proved his writerly mettle. Yet Sanderson claims his love for creating fantastical worlds transcends success or failure. "I decided years ago that even if I never had one book published and died with 80 unread titles in my drawer, writing was something I would still always do," he said. When • Monday, Aug. 30, midnight. Store hours are Monday, 7:50 a.m.-6 p.m., Tuesday-Friday, 7:50 a.m.-8 p.m., Saturday, 10 a.m.-6 p.m. When • Tuesday, Aug. 31, 7 p.m. Store hours are Monday-Saturday, 9 a.m.-10 p.m.; Sunday, 11 a.m.-7 p.m.
Info • Call 801-282-1324 for more information or visit http://www.brandonsanderson.com.